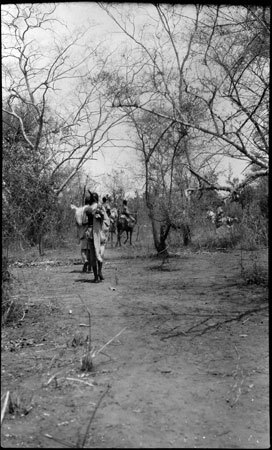 A rear view of several mounted Sudanese expedition porters or gun carriers making their way through wooded country, perhaps assisting Meek's expedition in its hunting activities. Morton, Chris. "Mounted expedition porters" Southern Sudan Project (in development). 03 Jan. 2006. Pitt Rivers Museum. <http://southernsudan.prm.ox.ac.uk/details/1998.204.5.78/>.